The Santa Clara Abel Santamaria Airport (a.k.a Cayo Santa Maria airport) is a small-size international airport located about 10 km (6 mi) outside the city of Santa Clara, which is the capital city of the province of Villa Clara in Cuba. It's named in memory of Abel Santamaria Cuadrado (1927-1953), an important leader in the Cuban Revolutionary movement. This airport handles both international and domestic flights. It serves mainly the popular beach resort destinations of Cayo Santa Maria, Cayo Ensenachos and Cayo Las Brujas, and also the city of Santa Clara and the central regions of Cuba (such as Trinidad, Playa Ancon, etc.). The airport was remodeled and expanded in 2006 to be able to receive three times more passengers. It has only one terminal building which is air-conditioned and non-smoking (except for one designated area). There's no jet-bridges, mobile staircases are used for embarking and disembarking passengers onto the tarmac. • Arrivals area: Cuban Immigration and Customs, baggage carrousel, bathrooms, public phones, currency exchange, snack bar (outside), car rental (outside). • Departure hall (public area): check-in counters, bathrooms, Immigration/Passport Control, public phones, currency exchange. • Departure Gate Lounge: Waiting lounges (public and VIP), enclosed smoking area, bathrooms, currency exchange, public phones, snack bar, Duty-Free shop, a liquor/cigars/chocolate shop. • Click the following link for more information about the Ground Transportation (buses, taxis, car rental) available at the Santa Clara airport. This airport handles only internal flights, and small size aircrafts. The Cuban airline Aerogaviota operates two flights daily between Havana (Playa Baracoa terminal) and Cayo Las Brujas (more information about these flights in our Getting Around section). 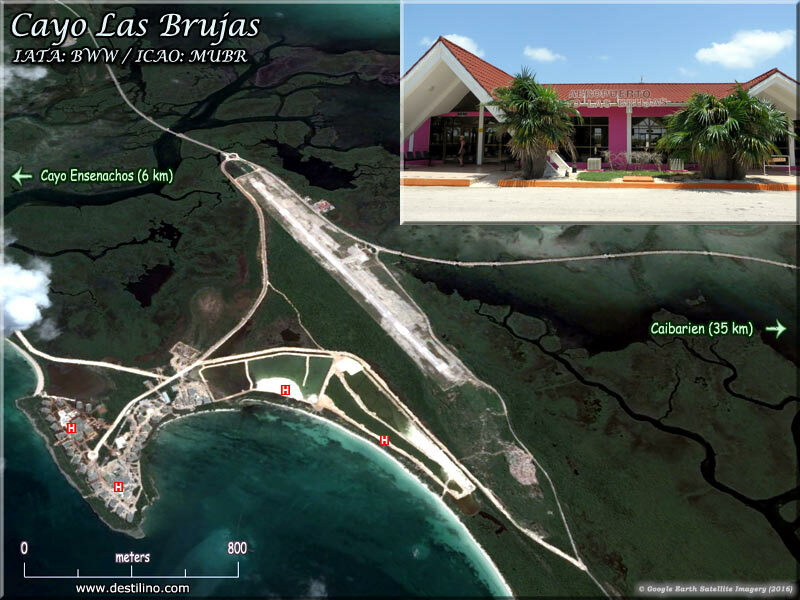 The Las Brujas airport is mainly used as a gateway for day-trips (excursions) to Havana for tourists staying in Cayo Santa Maria (and Cayo Ensenachos, Cayo Las Brujas); and also for international travelers who flew to Havana (instead of Santa Clara) and need to take a domestic flight to get to Cayo Santa Maria. This airport has a 1,800 meters runway, which is too short for large aircrafts. There used to be a rumor about extending the runway length (as they did in Cayo Coco) to make it an international airport, but we were told that it would not be possible due to lack of space and the fact that it's a protected area. To learn more about Abel Santamaria airport. Visit our dedicated website of all international airports in Cuba. The most complete « unofficial » airport travel guide.